Welcome to all you need to know, and probably would rather not know, about mattress toppers. Mattress toppers serve many useful and valuable purposes when choosing the right bed. If you’re in a hurry read our top 5 tips or for more information covering everything please read on. A mattress topper is an additional comfort layer that is added to a core mattress to increase longevity and also increase the comfort of the mattress. We recommend that all mattresses should have a topper and our dual construction method provides each of our foam beds with a built-in removable mattress topper. When trying to buy a mattress topper in retail shops, this is where the confusion starts; as you try to find the elusive ‘perfect mattress topper’. Most of our foam mattresses use a dual construction method which includes a topper, with the exception of some latex models, but I’m sure it is still on your list of questions to find out what a mattress topper does. The problem is the market is flooded with hundreds of different mattress toppers, some are brilliant and some way below par for the job. You can find toppers everywhere from bespoke bed shops to discount shops meaning that there is a huge variety of offerings. Prices vary greatly and in some cases the only option you’re presented with is what size you want rather than the depth or firmness of the topper! With mattress toppers one size does definitely not fit all. Firstly you need to make sure it complements the bed you have and is of the necessary depth to have any real benefit. At John Ryan By Design, we have individually matched our mattress toppers to our range and also have a range of stand-alone toppers that can be bought separately to fine-tune your existing mattress. We offer hybrid foam and natural latex mattress toppers. As a rule, of thumb, the correct mattress topper can make a great mattress into a fantastic one. On the other hand, a topper can make a bad or unsuitable bed, much more bearable. Our site has received many comments from readers who questioned that if the mattress was expensive and had adequate comfort layers already, why was it deemed necessary to add further by way of a topper? This is an excellent question and the quick answer is that toppers increase the comfort and extend the longevity of your mattress. There’s much more to toppers than meets the eye so read on for a more detailed look. The benefits of using a mattress topper can be split into two categories, increasing comfort and increasing the longevity of the mattress. They are an excellent way of increasing the life of your bed and providing you with flexibility. Let us go into a little more detail on the benefits of mattress toppers. If you choose to sleep on a core mattress without adding an additional topper, it will not be too long before the softer top component compresses under your bodyweight and the mattress will become discoloured through perspiration. Adding a topper gives another layer which will compress before the mattress; giving you more comfort but ultimately a layer that can be easily turned and rotated. We’ve spoken on mattress construction about the issues with one-sided mattresses; a necessary construction method with foam beds. A topper helps to address this issue. Body Perspiration – On average the body releases up to two pints of moisture each night. This is through sweat, breathing and other fluids. The only place for this to go is into the covers, duvet and ultimately your mattress. A mattress topper allows you to stop sweat and perspiration from reaching your core mattress. So even though the topper and covers will still absorb perspiration, it is far cheaper to remove, wash or even replace these than the entire mattress. Dead skin and bacteria – These will inevitably end up on the closest layers to the body and by using a topper again you can keep these away from your mattress. Undue settlement and indentations – As we have discussed on sagging, eventually foams will compress somewhat as this is the nature of the foam structure. By using a topper, you ensure that the top layers take any sag and not the mattress. 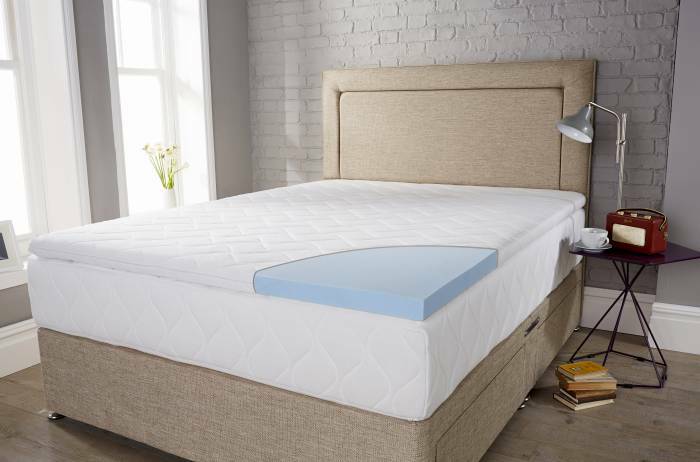 It also allows you to replace the topper should you need to, ie if your body weight increases significantly pushing the original suitable mattress towards its limits. Ultimately it will allow you to replace the top layer or tweak the mattress feel later on. The additional benefits you get from utilising toppers will, in the long run, pay dividends, it allows your mattress to stay newer for longer and provides you with increased comfort. When the topper has taken all it can after the barrage of nightly activities, it is a small expenditure to replace as necessary rather than reaching the stage where the complete mattress requires replacement. 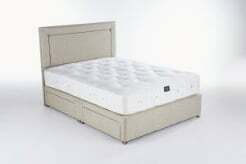 Can a latex or foam topper be used on a pocket sprung mattress? The answer is yes. It will change and soften the top layer of the pocket sprung mattress, but any quality mattress topper should be suitable for a pocket sprung mattress. The type of topper you choose will determine the extra sink it provides. If you need more guidance on how a topper may affect the feel of one of our mattresses, then please get in touch for tailored advice. 1. A suitable mattress topper will protect your mattress from the three evils. Body perspiration, dead skin/ bacteria and indentations/ settlement issues. 2. A high-quality mattress topper will provide additional comfort layers, providing you with an even more comfortable and forgiving mattress. 3. A mattress topper will help extend the life of a mattress, especially a no turn Memory foam mattress as you can turn and rotate the topper to reduce compression or wear. It can also be replaced more easily and cost-effectively than the entire mattress. 4. Usually, the topper is made of the same or similar material as the mattress ie memory foam with a memory foam topper vs natural wool pocket sprung bed with a wool or cashmere topper. This is to keep consistency with the mattresses comfort and response levels. However, there is nothing to stop you from experimenting with different topper materials. 5. A mattress topper can make a good bed fantastic, and make a bad bed much more bearable! A mattress protector should be the very least of your efforts to help reduce the damaging effects of sweat and other fluids during your time spent in bed. A mattress topper is a great way to increase the comfort layers of your mattress. They also help to reduce the wear and tear put on your core mattress. A good rule of thumb is to match the materials of the topper to those within the core mattress though this is not mandatory. If you need more help why not have a look at our single and double mattress toppers in our shop for details of our range.